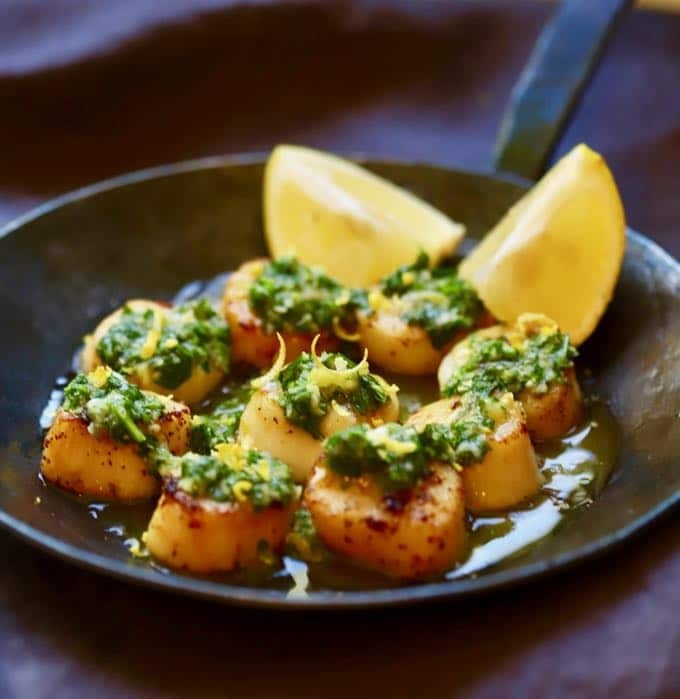 Pan Seared Scallops with Salsa Verde is a delectable, quick and easy seafood entree that you can have on the table in under 15 minutes. 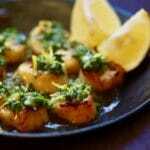 In this flavorful recipe, mild, sweet, briny sea scallops are quickly seared and then topped with a lemony salsa verde made with fresh parsley, lemon zest and juice, scallions, garlic and olive oil. While you probably know that eating seafood is good for you, did you know scallops are more than 80 percent lean protein, plus they are also a good source of Vitamin B12, magnesium and potassium? And, coming in at only 210 calories, this delicious entree is perfect for a low-calorie diet. One of my favorite summertime activities growing up was snorkeling for scallops. In our area, scallop season runs roughly from the first of July through mid-September. Floating with a mask and snorkel in the shallow saltwater grass flats of the Gulf and watching the sea life below, including crabs, seahorses, and small fish hiding in the seagrass is a mesmerizing experience. But finding scallops, with their vibrant blue eyes and the easily recognizable shells, is the icing on the cake. Of course, the scallops we find in our area are the smaller bay scallops, which are a delicacy unto themselves. This recipe, however, calls for larger sea scallops. Large sea scallops are found off the northeastern coast of the United States and the eastern coast of Canada in the Atlantic Ocean. Luckily for us, they can usually be found year round in the frozen food section of your grocery store. If you are wondering what to serve with these tasty scallops, they would be wonderful served over orzo or another pasta. Also, Scalloped Tomatoes would be an excellent choice for a colorful side-dish. If you like seafood recipes, you might also like these recipes: Easy Pan Seared Grouper with Gremolata, Easy Pan Seared Salmon with Asparagus, and Brown Sugar Glazed Bacon Wrapped Shrimp. Need more? Check out all of my seafood recipes here! Combine the minced garlic with olive oil and blend until smooth in your food processor fitted with a steel blade, or you can use a blender. 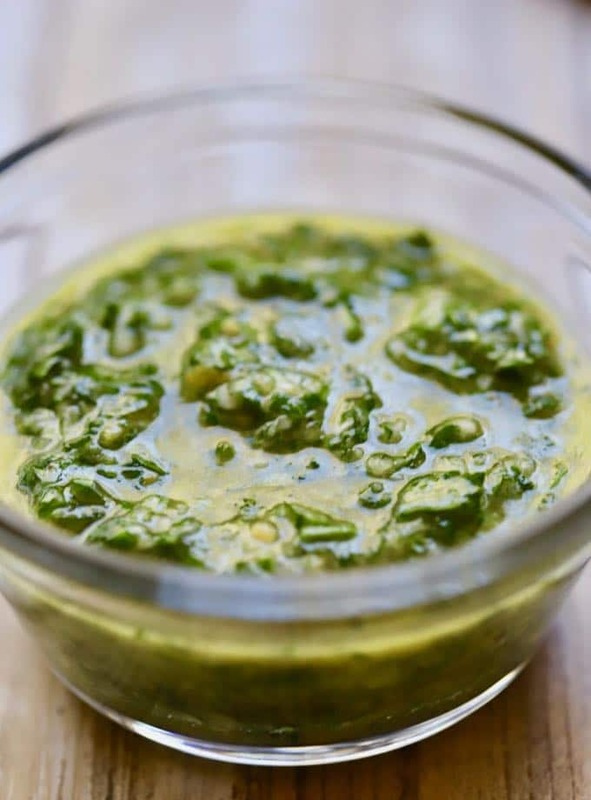 Add parsley, lemon zest, salt, pepper, the juice of 1/2 lemon and scallions to the olive oil mixture and pulse a few times until everything is minced and looks about the consistency of pesto. Set the salsa verde aside. Remove the side-muscles on the scallops (the side-muscle is a little rectangular tag of muscle tissue on the side of the scallop that secures it to the shell). To remove it, just pinch it off and discard. Rinse the scallops and pat completely dry with a paper towel. Season both sides with salt and pepper. Add butter and olive oil to a 12 to 14-inch skillet over medium-high heat. Once the pan begins to smoke, gently add the scallops, making sure they do not touch each other. Cook the scallops for 1-1/2 minutes and turn over. Cook for an additional 1-1/2 minutes or until both sides are golden brown and the scallops are opaque in the middle. Do not over-cook or they will be tough. 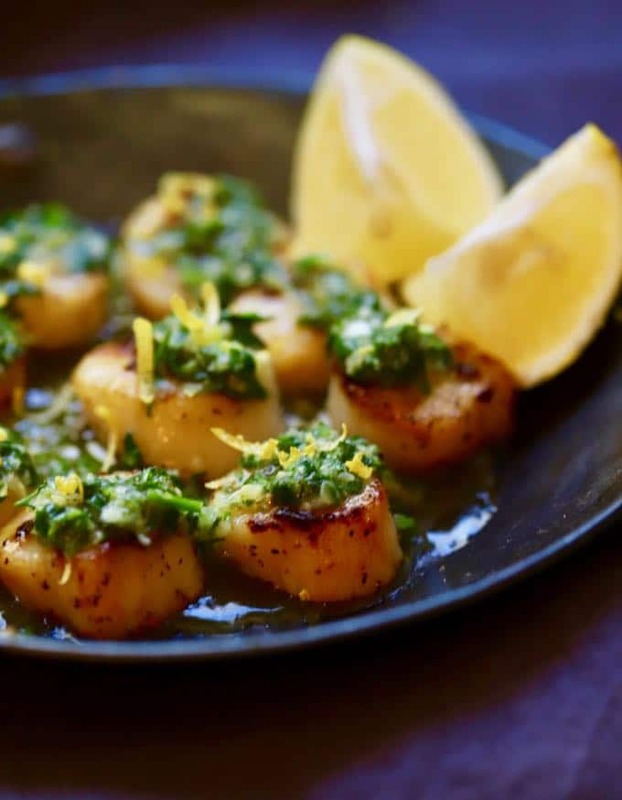 Remove the scallops from the pan and top each with a small spoonful of salsa verde. 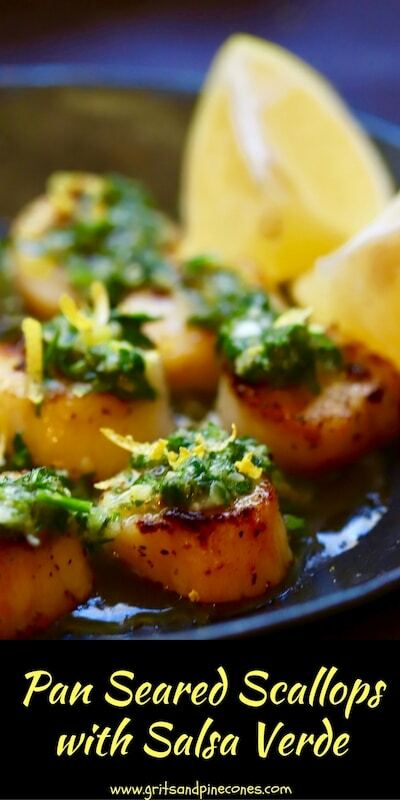 Squeeze the juice of the remaining 1/2 of a lemon over the scallops and serve immediately. Notes: Scallops take less than 5 minutes to cook! Have the rest of your meal ready and the table set before cooking them. They are at their best if eaten right away while still hot! 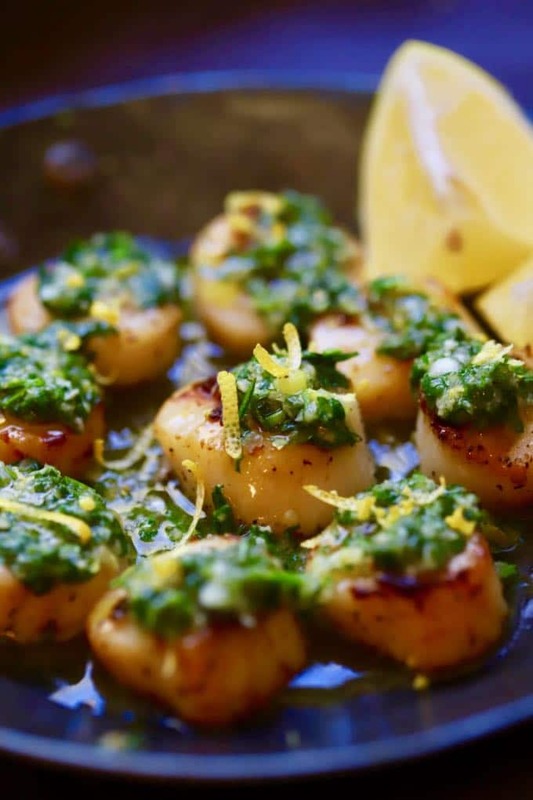 Pan Seared Scallops with Salsa Verde is a delectable, quick and easy, low-calorie, healthy, seafood entree that you can have on the table in under 15 minutes. 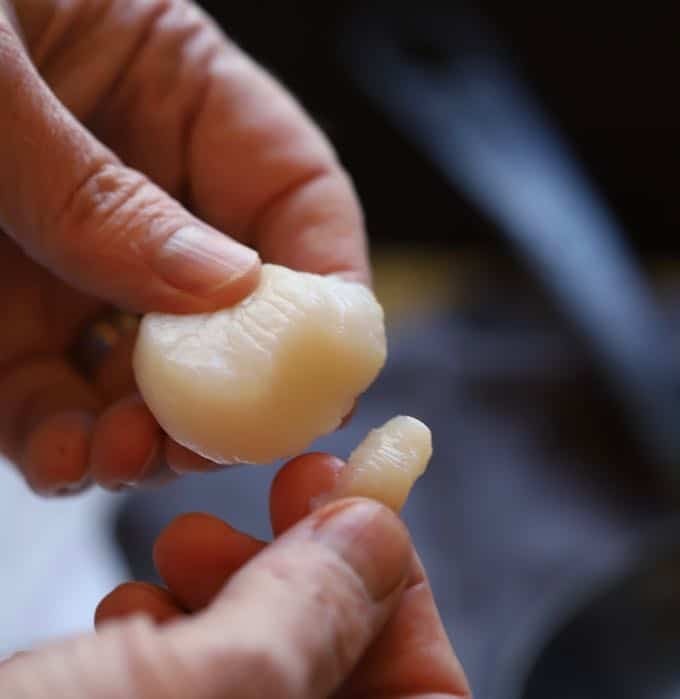 Remove the side-muscles on the scallops (the side-muscle is a little rectangular tag of muscle tissue on the side of the scallop that secures it to the shell). To remove it, just pinch it off and discard. Rinse the scallops and pat completely dry with a paper towel. Season both sides with salt and pepper. Cook the scallops for 1-1/2 minutes and turn over. 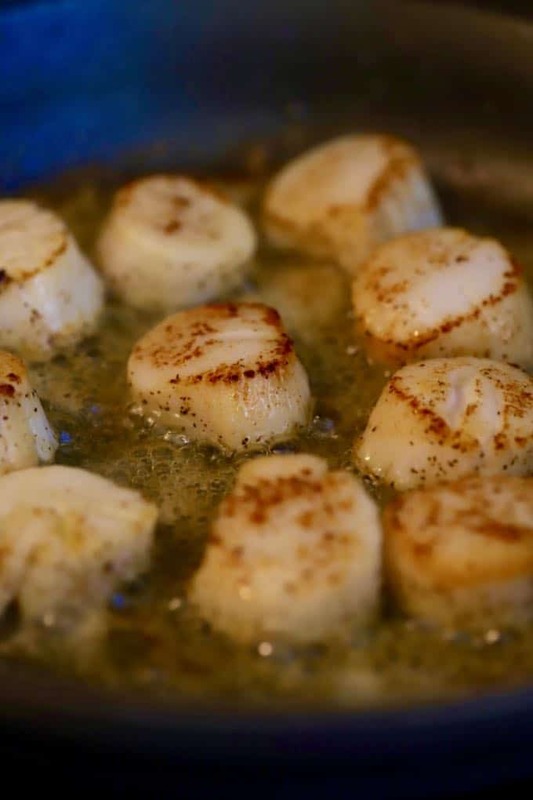 Cook for an additional 1-1/2 minute or until both sides are golden brown and the scallops are opaque in the middle. Do not over-cook or they will be tough. Why have I never tried cooking with scallops before. This looks so good! Hi Cathleen, you will love cooking scallops! They are as quick and easy as shrimp and just as delicious! What else would you serve with this entree? So sorry to take so long to get back with you. Usually, I serve these scallops with a simple salad and maybe a baked sweet potato or twice baked potato. They are fairly rich so I try to keep the sides pretty plain. Thank you! I will try that!